Marco Rubio. Chris Christie. Paul Ryan. Rand Paul. Jeb Bush. These are names typically bandied about as potential candidates for the Republican presidential nomination in 2016. One name you don’t hear a lot is Ted Cruz, but according to the National Review, you should. 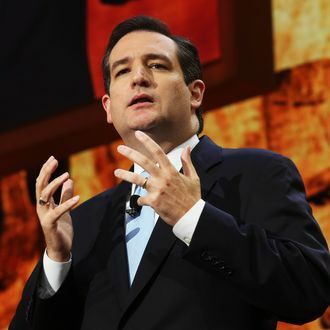 Freshman senator Ted Cruz is considering a presidential run, according to his friends and confidants. Cruz won’t talk about it publicly, and even privately he’s cagey about revealing too much of his thought process or intentions. But his interest is undeniable. “If you don’t think this is real, then you’re not paying attention,” says a Republican insider. The benefits to Cruz of putting this idea out there in the universe are obvious, and reliable. People pay more attention to you if they think you’re a future candidate for president, and if there’s one thing Cruz loves, it’s attention. But let’s assume his interest is legitimate. What are Cruz’s prospects for winning the GOP nomination in 2016, and then the presidency? They are absolutely terrible. Cruz is smug, unlikable, and, as David Brooks recently observed, “off-putting.” In his short time in the Senate, he’s irritated members of both parties with a take-no-prisoners attitude and tactics that have been compared to those of Joseph McCarthy — one GOP senator told Politico in February “that fellow Republicans were already getting ‘annoyed’ by Cruz’s antics.” He’s not a bridge-builder, working to solve problems; he’s a gotcha-obsessed, far-right partisan enamored with his own intelligence and dedication to his principles. The ability to make Democrats, Establishment Republican senators, and David Brooks recoil is, admittedly, not the worst quality when your electorate is Texas. But it’s totally unhelpful for someone who wants to be president — particularly a Republican, who can hardly get by just by appealing to the party’s ever-shrinking base. Not everyone agrees. “Cruz already has grassroots on his side, and in this climate, that’s all he may need,” the previously quoted “insider” tells the National Review. This is a fantasy that only those firmly entrenched inside the Cruz bubble could possibly believe. The GOP grassroots isn’t excited about Rand Paul? Marco Rubio? Paul Ryan?